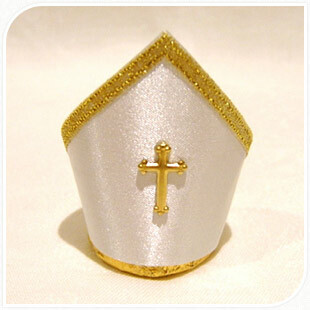 A fairly holy hat, yesterday. A popular Irish priest, now based in the US, has claimed that mass is no longer any craic. Father Seth Goldstein, a 44-year-old cousin of nine based in Wisconsin, said that due mainly to a few hundred bad eggs on the tree, that mass was no fun, forcing people to stay away in droves. He failed to elaborate by telling us what a ‘drove’ was though. Goldstein, who graduated from the seminary in County Monaghan in 1961, when he was just nineteen, worked for several years in a small parish in Leitrim, before emigrating to the United States, where he worked first as a taxi-driver in New York City, before touring the country as a backing singer for Celine Dion. He returned to the priesthood part-time in the early 1980s, rising to the rank of Lieutenant Cardinal, in a small parish on the Virgin Islands, which is several thousands miles west of County Monaghan. “Back then, we’d have a good oul’ laugh, making the altar boys, or altar boyos, as we called them, laugh when they were supposed to be working. One time I switched the altar bells that they had to ring, with an elderly angry barn cat in a paper bag, ah it was a great oul’ laugh”, said Father Seth, over the phone from his lakeside retreat in Havana. “It’s different now though, sure now we do have to learn hymns and prayers and that, and the altar boys have no senses of humour. A while back I put a ‘kick me’ sticker on one young lad’s back, and kept kicking him up the arse during mass, he was bawlin’ cryin’, it was hilarious, but sure his oul’ fellah came round to the sacristy afterwards and kicked seven shades of sh*te out of me. Sure that’s no craic”, he said. Attendances at mass have dropped in the US and Ireland, with nine churches and two cathedrals having had to close down in the past hour and a half due to poor sales and leaky roofs. Terry McNee, a former Protestant now working as a sales rep for the church in County Wicklow, has recently introduced schemes to win the punters back, including a giveaway of bobblehead dolls of Pope Gregory IV, Pope Steve the 6th and Ireland’s very own, Father Luigi Gomez (the ‘Hula Hoop King of Wexford’). The plans have so far failed however, with nobody showing up for mass, possibly, because the mass dolls were, as one child described them, ‘shite’. Words by Bosco Coppell, Pictures by Dervla’s Knick Knacks and Root Canals.